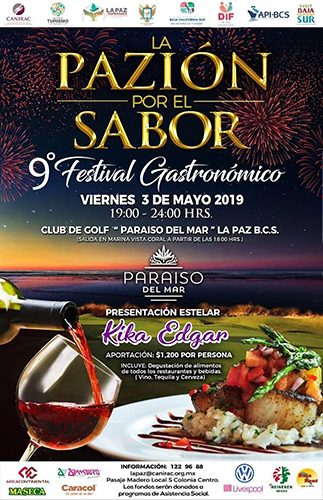 CANIRAC 2019 EVENT: To offer bus transportation from Liverpool – Fundación Ayuda Niños La Paz, A.C.
TRANSPORTATION: CANIRAC will offer transportation from Liverpool for the May 3 event “The Passion of Taste” that will take place in Paraíso del Mar (PDM). Buses will leave regularly from the parking lot behind Liverpool or you may choose to take one of the water ferries. Starting at 6:00 p.m., boats will leave from the dock at Marina Cortes (also referred to as Vista Coral) every ten minutes to PDM throughout the event; boats will also take you from PDM back to the dock as often as there are passengers who wish to return. After closing at midnight, boats will run from PDM back to Marina Cortes until the last person has left the venue. For those who do not wish to take the boat, you may park in the lot behind Liverpool which is in the shopping center previously called the Shoppes….now called Galerias La Paz, on Blvd. Olachea. This is a large parking lot; buses will drive attendees to the event at Paraiso del Mar, which is approximately a half-hour ride. Over the next two weeks, additional ticket sales times and places will be posted on Sundays. If you would like to make other arrangements to purchase your tickets please notify me at jupete49@hotmail.com or at fanlap@hotmail.com. INCLUDES: Ticket price covers transportation to and from the venue, all-you-can-eat and drink (soft drinks, beer, wine or tequila) from approximately eighty restaurants from Los Cabos, La Paz, Mulege and other cities in Baja California Sur. ENTERTAINMENT: Additionally, ticket price also includes entertainment. Thank you to all who support FANLAP and our programs to help the disadvantaged children and youth of La Paz. We wouldn’t be able to help all the children we have helped through the years without your help. FANLAP will receive 1/2 the cost of the ticket (600 pesos) for our programs of education for children and adolescents who live in impoverished neighborhoods on the outskirts of La Paz. No pierdas del evento de CANIRAC, May 3 en Paraiso del Mar en el Mogote. Será de primera clase. Aquí hay una muestra del cantante Kika Edgar. Gracias, Kika! Thank you for helping the disadvantage children of the La Paz colonias. See you there!